Resume Formats in Various Countries: How Do They Differ? Employers practice different approaches when hiring workers. Though most firms look for similar experiences and qualities in their applicants, resume formats in various countries still differ according to purpose, culture, and location. Some nations may ask for personal data, yet others may not suggest them at all. As resume writing is specific to each country, you must consider the styles or formats preferred by your target firm. 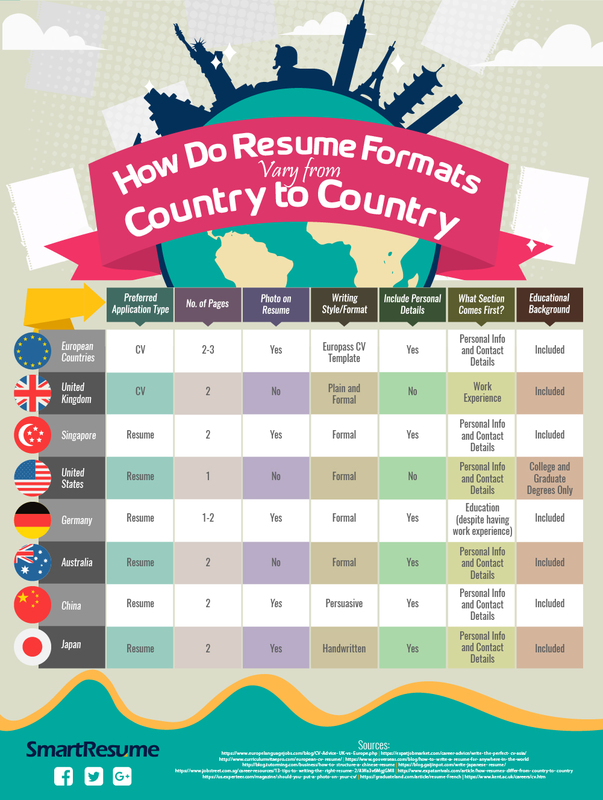 If you are wondering how most resume formats in various countries differ, you may check out the outline and the infographic we have prepared below. To comply with the European Parliament and the Council’s decision to make skills clearer and easier to understand, most countries in the European Union require applicants to submit their CVs using the Europass format. This standard template allows job hunters to describe their education and skills using a user-friendly layout and structure. Besides the standard document, many companies also advise job hunters to attach a professional photo on the CV. In fact, many European firms consider a CV or job application more appealing with a professional pic. Unlike its neighbors in Europe, many firms in the UK prefer a different resume writing format for their applicants. For instance, they discourage the inclusion of photos and work experiences in their hopefuls’ CVs. The ideal length for job applications in the UK is two pages. If you are looking for a job in Singapore, you must start your resume with your name and contact details. You need to write a well-crafted job objective followed by a summary of your qualifications. Likewise, you must highlight your professional skills together with your career feats. Resume writing in the United States evolved into a much more concise format. If you are joining an American firm, do not include a photo unless you are applying for a modeling job or any post that demands certain physical traits. When writing your educational details, include only your university and graduate school degrees. Limit personal info and keep your resume into a single page. 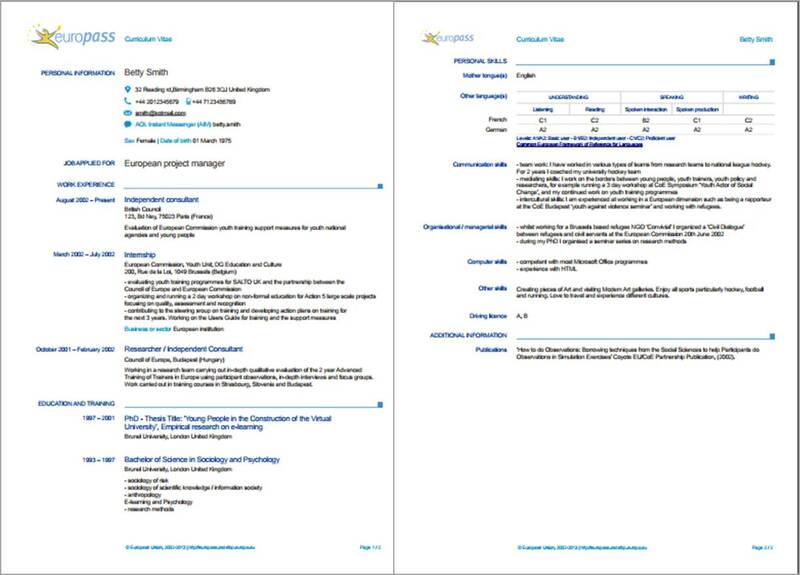 Resume writing in Germany follows a simple format. Apart from a photo, most firms in this country require a two-page application document. They value and focus greatly on education, so you must write your school credentials in detail and place them before your work experiences section. Language skills are an advantage, too, so do not forget to include them in your resume. Similar to the UK and the US, most Aussie firms disapprove of adding a photo on the resume. Besides the need to limit your resume to two pages, you also need to highlight your studies and previous training to attract employers. Spelling is likewise a big issue when applying for companies in Australia so make sure you use Australian English or English UK to avoid misspellings in your resume. When writing a Chinese resume, make sure you do not skip on your personal info. Highlight a professional photo of you on the top right corner of your resume. As educational info appears to be an important part of a Chinese resume, place it before your work experiences section. Despite countless digital platforms and electronic websites, many Japanese firms still prefer a handwritten resume than the computerized versions. Employers believe that handwritten resumes are more personal and direct and reflect a person’s personality and character. As regards the format, many firms advise job seekers to use “Rirekisho,” which is the standard resume format in Japan. The ideal length for such resume is up to two pages and a passport-type photo is useful in aiming a target job. Though it is crucial that you know how resume formats in various countries differ, you must also not forget to home in on your skills and unique qualities. These resume formats will help you make a good impression, but experiences and traits will still play the biggest role in the job hunting process. Are you hesitant to write your own resume or CV? Let us help you out! Browse through our site and let our career experts handle your worries in resume writing.